No to Bush, Kerry, Nader! 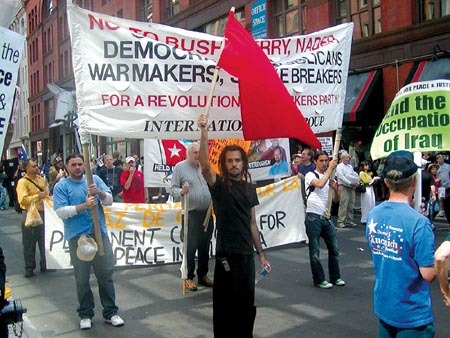 Internationalist Group at Boston march on Democratic convention, July 25. Seldom has the fraud of bourgeois electoral “democracy” been so blatant. It’s not just about a rigged vote in November, in which big bucks and dirty tricks (and perhaps an unelected Supreme Court again) determine the outcome. A quarter million protesters, possibly more, are expected to protest outside the Republican National Convention (RNC) in New York City in late August. But a whole operation is underway to channel outrage against the war and hatred of Bush into the Democratic Party, which vows to continue the war and to continue the Bush policies on everything from the economy to “terrorism.” A host of antiwar groups (United for Peace and Justice, International ANSWER, Not In Our Name and others) have made sure that the march past Madison Square Garden is in reality a march for John Kerry. In calling to “stop the Bush agenda,” to “put George Bush on trial for war crimes,” etc., they propagate the lie that this is just “Bush’s war,” instead of protesting all the warmongers, union-busters, bigots and racists. In fact, the war is a bipartisan effort by U.S. imperialism to subjugate the world. These “peace” coalitions all support the capitalist system of war, exploitation and racism. Some of their left-wing components may call themselves socialists, but they seek to chain the working class, minorities and opponents of imperialist war to Democratic liberals, on a program to clean up U.S. imperialism’s act. They just want to change the foreign policy to make it appear more “people-friendly.” If George W. Bush brazenly launches “preemptive war” to make the world safe for Halliburton and Big Oil, John F. Kerry would continue it in the name of making the world “safe for democracy,” as his Democratic predecessors have. From Woodrow Wilson in World War I to Franklin Roosevelt in World War II, Harry Truman in the Korean War, John Kennedy and Lyndon Johnson in the Vietnam War, Jimmy Carter in the second Cold War and Bill Clinton in two wars on Yugoslavia, the Democrats are the traditional “people’s party” of imperialist war. And the Greens, like the “peace” coalitions, are a tail on the Democratic donkey. The Internationalist Group, section of the League for the Fourth International, calls to fight against all the capitalist parties, and to build a revolutionary workers party. While the popular front peace groups pleaded to “stop the war” on Iraq (appealing to liberals who backed the war on Afghanistan), the IG/LFI called to defend Iraq and Afghanistan and defeat U.S. imperialism. Instead of impotent “peace crawls,” we called to mobilize the working class in concrete action against the capitalist war machine (“hot cargo” military goods, labor strikes against the war). Today we call to intensify class struggle internationally and in Iraq to defeat the colonial occupation, drive out the imperialist troops (along with their mercenary clients) and smash the Iraqi puppet army. Where liberals look to the United Nations and European imperialists to put a “multilateral” cover on U.S./British aggression, we say, U.N./NATO stay out of Iraq! 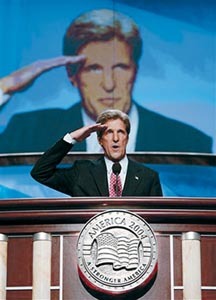 “I’m John Kerry, and I’m reporting for duty.” These were the words of the Democratic presidential candidate as he began his speech accepting the nomination. The music blared Bruce Springsteen’s “No Surrender,” as he strode through the hall. Giving a snappy military salute, he vowed to be a better commander in chief for a “nation at war,” an unswerving commander, an unbending commander, who “will never hesitate to use force when it is required.” Required for what? This set the stage for the election as a contest between two “war presidents” over who can best defend the interests of U.S. imperialism. The military theme was everywhere: a biographical film made with the help of director Steven Spielberg using movies of Kerry as commander of a Navy Swift boat in the Mekong Delta; coming across the Boston Harbor in a landing craft with some of his “band of brothers” from Vietnam as if he were crossing the Delaware; putting a cast of a dozen retired generals and admirals on stage to endorse Kerry as a steady hand at the helm. “America, hear this soldier,” intoned Gen. Wesley Clark, the “butcher of Belgrade” who deliberately bombed maternity hospitals and refugee trains during the 1999 war on Yugoslavia. Kerry declared that he “defended this country as a young man,” thus endorsing the Vietnam War he once upon a time called a “mistake” as a leader of Vietnam Veterans Against the War. The ruling class figures they have opponents of the war locked in a box with no way out. 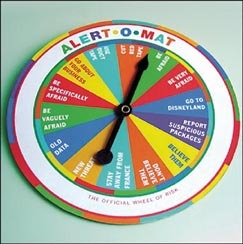 With the aid of the reformist left, the attack on Iraq has been labeled “Bush’s war,” although it was approved by a bipartisan majority in Congress. The attacks on civil liberties have been identified exclusively with Bush’s top cop, John Ashcroft, and terror meister Tom Ridge even though all but one Democratic senator voted for the USA PATRIOT Act. Liberal opponents of the war have been terrified into voting for “anybody but Bush” (ABB), which translates into “nobody but Kerry.” The convention didn’t even throw a bone to antiwar Democratic voters. The platform declared, “People of good will disagree about whether America should have gone to war in Iraq.” Since the convention, Kerry has said flatly he would vote for war again, even knowing Saddam Hussein had no “WMDs” as the Bush administration had claimed (as did the “free but responsible” bourgeois media, the pliant United Nations, etc.). “Antiwar” primary candidate Dennis Kucinich ordered his delegates to drop their fight over Iraq, and the one-time frontrunner was given a few minutes at the podium to declare, “I’m Howard Dean, and I’m voting for John Kerry.” The Democratic “doves” did their job of attracting antiwar youth to this capitalist war party, and now their duty was to keep them there. Meanwhile, Kerry wraps himself in the star-spangled banner and promises to out-Bush Bush on everything from military spending to tax cuts, while posing as the most resolute champion of beefing up the arsenal of war and repression (double the Special Forces, 40,000 more troops to Iraq, etc.). The Democratic nominee agreed to the Bush administration’s definition of a “global war on terror,” vowing that he would “fight a more effective war” than Bush. Convention delegates chanted “U.S.A., U.S.A.” to scenes of their candidate in Vietnam. When Kerry talks of “multilateralism,” he cites Prince von Metternich in the 19th century and Henry Kissinger in the 20th as masters of the “machinations of alliance politics” – that is, the notorious architects of counterrevolutionary alliances – and the policies of George Bush I (New Yorker, 26 July). Former Reagan speechwriter Peggy Noonan wrote in the Wall Street Journal (22 July), “There’s no difference between Bush and Kerry on the war except people know Mr. Bush means it and assume Mr. Kerry doesn’t.” But in fact, Kerry “means it.” In an interview with the Journal, Kerry told this mouthpiece of finance capital that he aimed only to “reduce” the number of U.S. troops “significantly” by the end of his term. A vote for Kerry is a vote for continued U.S. occupation and mass murder in Afghanistan and Iraq, for four more years and on into the future. A vote for the Democrats is also a vote for intensified police-state measures to regiment the U.S. population for continual war. As the bourgeois candidates squabble over the issue of “security,” each portraying the other as a wimp, the Democrats point out that Connecticut senator Lieberman first proposed a Department of Homeland Security (the 2002 Lieberman bill), over initial opposition from Bush. They claim (rightly) that the Clinton administration’s Federal Death Penalty Act (1994), Executive Order 12949 (1995) authorizing searches without warrants, Illegal Immigration Reform and Immigrant Responsibility Act (1996), and Antiterrorism and Effective Death Penalty Act (1996) prefigure the draconian USA PATRIOT Act. New York senator Schumer in particular pushed for the Maritime Transportation Security Act (2002), which goes after port workers in the name of fighting “risks to security” on the waterfront. Liberal darling NY senator Hillary Clinton, in turn, has adopted the posture of an extreme war hawk on Afghanistan and Iraq, bragging that she has voted for every military appropriations bill since taking office, and calling for doubling federal money for police security against protesters at the Republican convention in New York this month. Ex-prosecutor Kerry and his fellow Democratic senators proclaim they are true capitalist repressors, and they’re right. To be sure, the Democratic Party still postures as “friends of labor” but the pretense is wearing thinner all the time. At the Democratic National Convention in Boston at the end of July, barely a quarter of the delegates were union members, the lowest percentage since 1988. (Moreover, only 18 percent of the delegates were black, compared to 28 percent of Democratic voters.) Just about the only “pro-labor” plank in the party platform, largely meaningless in any case, is a call for a law against “permanent replacement of legal strikers” (“temporary” scabs are okay by them) and a vague call to “protect the rights of workers” to organize unions. But no “anti-scab” law is going to stop union-busting bosses from hiring strikebreakers, nor will the labor bureaucrats’ dream of a “card check” law make a “level playing field” for unionization. These questions are decided on the picket lines, the battle lines of the class struggle. Meanwhile, Kerry has viciously attacked teachers’ unions, calling to “end teacher tenure as we know it” (recalling Clinton’s pledge to “end welfare as we know it,” which resulted in the welfare “reform” law, hailed by the 2004 Democratic convention, that cut off funds to millions of mothers and children) and to “to make every public school in this country essentially a charter school” (“Schoolyard Tussle,” The New Republic, 14 December 1998). Service Employees International Union (SEIU) chief Andrew Stern caused a stir at the convention when he complained that the Democrats were doing nothing about the “Wal-Mart” economy of low wages and no benefits, and said of the effort to build new union organizations, “I don’t know if it would survive with a Democratic president,” because “labor leaders would become partners of the new establishment” (Washington Post, 27 July). Over a century ago, the American socialist Daniel De Leon accurately described union bureaucrats as the “labor lieutenants of the capitalist class,” and Stern is no different. While he may bellyache about Kerry (Stern backed Howard Dean in the primaries), he still committed the union to spend $65 million this year to elect the capitalist Democrats. The SEIU, the largest union in the AFL-CIO, has initiated a “New Unity Partnership” with the recently merged UNITE-HERE, the Carpenters union and Laborers (LIUNA). But for all the rhetoric of revitalizing the hidebound union movement, this is just maneuvering among the labor fakers over the retirement of federation president John Sweeney, who talked the talk of massive organizing drives before settling into the easy chair at AFL-CIO headquarters. At bottom, all the union bureaucrats – in or out of office – play by the bosses’ rules, because they all support capitalism. While stiffing labor, the Democrats are playing for the Wall Street vote. Billionaire Kerry has recruited a number of top financiers to his team of economic advisors, including Warren Buffet (net worth estimated by Forbes magazine at $43 billion), George Soros (net worth $7 billion), Steve Jobs of Apple Computer (net worth $2.1 billion), Clinton’s former Treasury secretary Richard Rubin, investment banker Roger Altman and other top money men. (Incidentally, the F. for the middle name of the latest Democratic JFK is for Forbes, another branch of the same Boston Brahmin family that publishes the magazine that calls itself the “Capitalist Tool.”) Kerry told Business Week Online (23 July) that despite all his vituperation against “Benedict Arnold CEOs” in the primaries, “I am going to be better for business” than George Bush. If elected, Kerry would be the richest president in history, and indicative a growing trend among Democratic senators. The U.S. Senate has been a notorious “millionaires’ club” for well over a century, but lately the Democrats have been electing multimillionaire capitalists by the bushel including Wall Streeter John Corzine of New Jersey, department store mogul Mark Dayton of Minnesota, and former supermarket and department store CEO Herb Kohl of Wisconsin. In fact, according to CNN (13 June 2003), ten of the dozen richest senators are Democrats. Populists like Phillips (a former aide to Nixon’s attorney general John Mitchell) complain that today is a new “gilded age,” Mark Twain’s term for the late 1800s dominated by the Robber Barons who bought and sold presidents, senators and congressmen with abandon. They inveigh against a new “guardian class,” seeing today’s U.S. as a “plutocracy” as they yearn for a golden age of “grassroots democracy” (Jeffersonian Republicans or Jacksonian Democrats) and suggest reforms like term limits, holding national referendums and the like. The last time around they enacted an “election finance reform” which led to the current deluge of dollars. While the actual policy differences between the candidates dwindle to inconsequential, both Democrats and Republicans are using the elections to terrorize the population. Using a playbook inherited from Richard Nixon, they are stoking hysteria about new attacks on the “homeland,” U.S.-occupied Iraq turning into a “seedbed for terrorism,” and the need for “strong leadership” to meet the “threat.” The result is a situation in which Republican pundits argue that Kerry needs more dead American soldiers returning from Iraq in caskets in order to win, while Democratic commentators say that Bush depends on a terrorist incident – imagined or real, thwarted or realized – to stay in the White House. Since the powers behind Bush are determined to keep on milking the U.S. government (as well as looting Iraq), everybody is waiting for the administration’s “October surprise.” The day after the Democratic convention, Homeland Security czar Tom Ridge raised the terror level to Code Orange (high risk), citing “alarming” evidence of a plot aimed at financial targets in NY and D.C., while declaring that his information was “the result of the president’s leadership in the war against terror.” When it turned out that the “surveillance” reports on the Citicorp Center, World Bank, etc. were years old, it was widely concluded that the “plot” was an election ploy. Meanwhile, the Bush administration was actively considering “postponing” (i.e., canceling) the November elections. Newsweek (19 July) reported: “Ridge’s department last week asked the Justice Department’s Office of Legal Counsel to analyze what legal steps would be needed to permit the postponement of the election were an attack to take place. Justice was specifically asked to review a recent letter to Ridge from DeForest B. Soaries Jr., chairman of the newly created U.S. Election Assistance Commission.” The Office of Legal Counsel is the same outfit that in 2003 okayed U.S. torture of prisoners in Guantánamo and Iraq, and which more recently (April 2004) approved heavy-duty police tactics to intimidate “extremist” political protest, on the grounds that “any possible ‘chilling’ effect” would be “outweighed by the public interest in maintaining safety and order during large-scale demonstrations.” On this basis, U.S. agents around the country have been questioning activists about “possible indicators of protest activity.” In particular, a Federal Bureau of Investigation spokesman said they targeted “people that we identified that could reasonably be expected to have knowledge of such plans and plots if they existed,” about the upcoming Republican convention (“F.B.I. Goes Knocking for Political Troublemakers,” New York Times, 16 August). Scheduling the Republican National Convention in New York was an attempt to whip up anti-terrorist fears and patriotic fervor using the imagery of the 9-11 World Trade Center attacks. But to hold the RNC in NYC, where registered Democrats outnumber Republicans five-to-one and 92 percent voted for Democrat Bill Clinton in 1996, was also a deliberate provocation. Local opinion on George W. Bush (72 percent negative, according to the polls) is divided between a majority that considers him the devil incarnate, and Bush-Cheney-Rumsfeld-Ashcroft-Ridge to be the true “axis of evil,” and a minority that thinks that while the president may not be Satan, he is a madman capable of and most likely determined to blow up the world in order to realize his “born-again” messianic Christian vision of Rapture, Tribulation and Armageddon. (“God told me to strike at al Qaeda and I struck them, and then he instructed me to strike at Saddam [Hussein], which I did, and now I am determined to solve the problem in the Middle East,” Bush told former Palestinian prime minister Mahmoud Abbas in June 2003.) Posters are plastered around town saying “The Republicans Are Coming” with ex-mayor Ed Koch encouraging New Yorkers to “make nice” to the aliens. Other posters, with the same headline, show an apocalyptic scene with Apache helicopters and a face from Edvard Munch’s painting The Scream. For months, Republican mayor Michael Bloomberg and his New York Police Department commissioner Raymond Kelly have been bandying about the “threat” of anti-RNC demos while barring them from congregating in central locations. The NYPD has ordered that demonstrators marching on August 29 be pushed onto the West Side Highway, far from the convention site at Madison Square Garden. This would turn the highway into a giant police pen, with the expected hundreds of thousands of protesters backed up for miles, unable to hear speakers, in a location without shade, water or convenient access (or exit). This recipe for disaster is exactly what city and federal authorities want. Republican spin meisters would love to broadcast images of cops attacking demonstrators (while claiming that they are “extremist” protesters attacking cops). The reformist/liberal organizers of the August 29 march, United for Peace and Justice, buckled under to city pressure and accepted the West Side Highway site, but widespread reports that protesters would not enter this police trap and would head to Central Park, with a permit or not, forced UPJ leaders to backtrack. With the stage set for confrontation, everyone recalls the 15 February 2003 antiwar march when cops planned to lock up 50,000 demonstrators behind metal barricades, but instead 500,000 showed up and effectively shut down the entire East Side of Midtown for hours. In contrast, genuine communists oppose the trap of bourgeois “lesser-evilism,” fighting to defeat all the capitalist parties and to build a revolutionary workers party. But this is no real move to the left for the WWP, which is always and ever seeking to cuddle up to Democratic Party liberals. Like the ISO, their complaint about Kerry is that he is a soft-core version of Bush rather than a liberal. Thus while Workers World (15 July) says “No to Bush lite,” the ISO’s Socialist Worker (6 August) asks: “Bush vs. Bush Lite – Where’s the choice?” In reality, Kerry is running not as a watered-down version of Bush but as a more “effective,” “stronger” war president. Workers World (5 August) commiserates with antiwar liberals, wringing its hands about “Democrats saddled with support for Bush’s war.” In the same issue they hail the victory of liberal Cynthia McKinney in the Georgia Democratic primary. The WWP longs for the “good old days” when they were demo organizers for Democratic primary candidate Jesse Jackson. Most expressively, Workers World (15 July) plaintively appealed to Jackson to revive his “populist challenges” of 1984 and 1988: “Reverend Jackson, we have a proposal for you: Come and campaign with us, the candidates who embrace this legacy and are really fighting for jobs, peace and social justice!” The legacy that the WWP embraces is of Jackson’s effort to bring disenchanted black and labor voters back into the Democratic fold. Proclaiming wholehearted support for pro-Democratic Party demonstrations is the operational part of this statement, for it is utterly counterposed to an independent class policy against the twin capitalist parties. The SWP proclamation has the virtue of making explicit, albeit in somewhat more leftist language, the opportunist methodology of the reformist left, for whom talking out of both sides of their mouths has become second nature. Today’s SWP has its peculiar quirks – calling for “cheap credit for working farmers” and “price supports to cover production costs,” as if small capitalist farmers in the U.S. today are the equivalent of impoverished landless peasants. But at bottom their electoralist reformism is a continuation of the SWP’s “bring our boys home” social-patriotism of the Vietnam War era – an appeal to the bourgeoisie to cut its losses in a losing colonial war, rather than to fight for the defeat of imperialism. Revolutionaries have no interest in backing this kind of two-bit reformist campaign. Interestingly, however, the once-Trotskyist Spartacist League (SL) gave support to the SWP candidate for governor of California in a recall election last fall (see “California Recall Follies and the Bankruptcy of U.S. Bourgeois Politics,” The Internationalist No. 16, October-November 2003). Since the present reformist SWP ticket is running on a platform no different from that campaign, there is little reason for the SL not to support Calero/Hawkins as it zigzags to the right. As today’s “progressives” lament the lack of “democratic” foreign policy, the corrupting influence of money on the political process and so on (a staple of liberal Bush opponents such as the “Democracy Now” program on Pacifica Radio), they obscure the fundamental fact that bourgeois “democracy” is a façade for capitalist rule. The reformist “socialist” campaigns do not present a revolutionary challenge to bourgeois parliamentarism, but use electoralist politics to gain respectability. As Leninists and Trotskyists, we fight for an entirely different objective: to build a workers party that can lead the way to socialist revolution. Marx and Engels wrote in the Communist Manifesto (1848), “the executive of the modern state is but a committee for managing the common affairs of the whole bourgeoisie.” The government being the executive committee of the ruling class, it is necessary to forge such a revolutionary workers party through intervention in the class struggle, fighting to oust the present pro-capitalist misleaders and to place the workers movement at the forefront of struggles to liberate all of the oppressed.